This research seeks to contribute knowledge by describing, exploring, and analyzing prison services organized by Batam prisons. The results show that public service in prisons is a special public service involving a particular community. In general, public service in Batam prison has been well organized, but there are some areas of service that are still not good. The study also found three obstacles facing Batam prison in public service. Firstly, there is no special room for visitors and inmates who are legitimate married couples. Secondly, Batam prisons are already overcapacity. Batam prison is the ideal 542 people, but is currently inhabited by 1193 prisoners. Third, the difficulty of eradicating the control of drugs from within the prison. Based on the results of the study, it is known that 71.7% is a case of inmate drug, while the rest are other criminal cases. Thus the potential for drug control from within the prison is very large. In addition, the potential that may occur is the occurrence of cadres or municipal traders in prison because drug dealers or dealers can interact with drug users, or other inmates in public spaces such as places of worship, canteen and sports venues. PUTRA, Bobby Mandala. Analisis Pelayanan Pemasyarakatan di Lembaga Pemasyarakatan Kelas II A Batam. 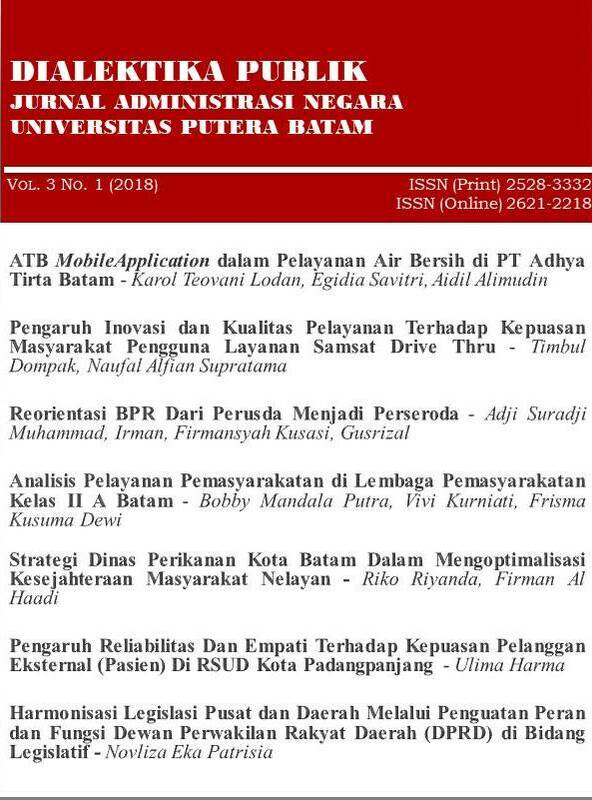 Dialektika Publik : Jurnal Administrasi Negara Universitas Putera Batam, [S.l. ], v. 3, n. 1, p. 22-30, aug. 2018. ISSN 2621-2218. Available at: <http://ejournal.upbatam.ac.id/index.php/dialektikapublik/article/view/662>. Date accessed: 23 apr. 2019.